Few have helped shape the evolution of the Australian wine industry like McWilliam’s Wines. 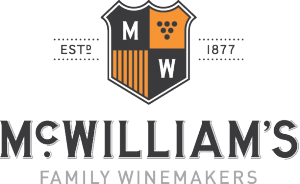 From humble beginnings on the outskirts of Corowa in 1877, the philosophy of putting quality of fruit first has ensured that McWilliam’s continues to be one of Australia’s most popular, respected and iconic wineries. We believe that good wines are made by people, not corporations. With six consecutive generations of winemakers and over 139 years of experience, the wines we make are more than just quality, award-winning wines. They are wines that tell the story of our family and a century long love affair with winemaking. McWilliam’s Hanwood Estate winery is located in the midst of a stunning rural New South Wales landscape that captures the heart of a family history, and the essence of Australian wine. Over 135 years, McWilliam’s has championed New South Wales wines and today sources the highest quality fruit from a variety of unique regions beyond the Riverina, including Hilltops, Tumbarumba, and Orange.